"A GM Freeze means: no new GM foods, no new GM crop approvals and no new GM crop growing areas. 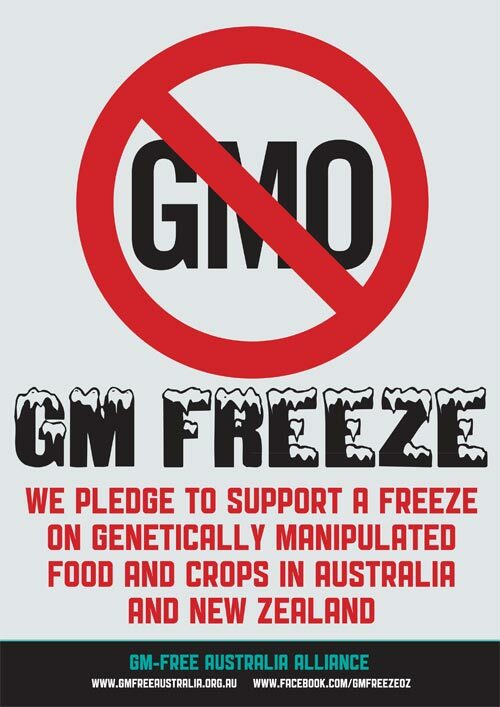 During the GM freeze, the safety GM foods on sale in Australia must be re-assessed and data on yield, pesticide use and effects on biodiversity of GM crops in Australia must be publicly investigated." We are calling for a freeze on all GM crops and food approvals in Australia. This means: no new GM crop approvals, no new GM foods and no new GM crop growing areas. During the GM Freeze, the safety of GM foods for sale in Australia must be re-assessed and data on yield, pesticide use and effects on biodiversity of GM crops in Australia must be publicly investigated. The two crops that we grow in Australia, GM canola and cotton, should be reviewed. Data showing crop yield, quantity of pesticides used per area and weed resistance should be made available to the public and reviewed by an independent panel including overseas experts.There are numerous studies showing that GM feed causes harm to experimental animals, for example, Monsanto’s canola Round Up Ready GT73 resulted in increased liver sizes of 15% when fed to rats in Monsanto’s own feeding trial. There is wide concern about the risks of GM harm to the environment - in the 15 years since the introduction of GM canola to Canada there is a pronounced increase in herbicide use and weed resistance problems. Farmers are forced to resort to 2,4-D to control the superweeds. Farmers are signing contracts which stop them saving seeds. UK Government trials over four years resulted in a halt to GM canola cultivation due to environmental concerns. GM companies such as Monsanto and Bayer own the seed - the farmer no longer does. If GM canola grows on your property, even if you did not plant it, the chemical company can claim ownership of these plants. This is a great threat to farmers. Studies show the crops that thrive best are those that are adapted to their microclimates over many generations of local farmer knowledge. GM crops impact our health. they are a threat to farmer’s livelihoods, food security, and the biodiversity of the planet. GM foods are minimally tested by the agrochemical companies and the results are often not made public. The GM Freeze campaign brings together individuals, companies, organisations, and communities which represent society’s wide ranging concerns about Genetically Manipulated food and farming. We are calling for an immediate halt to GM approvals in Australia and New Zealand, to any expansion of growing of GM crops, and a review of the crops that are currently grown.